The Village, on the site of the 19th Century Lumps Fort, was in constant use by the Military until after the last war, during which time it was a base for the training of the Royal Marines Special Boat Squadron (SBS). There are splendid views over the Solent and the Isle of Wight from the top of Castle Hill. A delightful place to visit with a fabulous selection of miniature models laid out in mature and colourful gardens. The railway that meanders through the village and gardens is a favourite attraction for young and old alike. 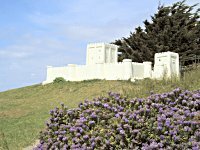 Situated just off the Southsea seafront, between Canoe Lake and Southsea Rose Gardens the model village is open daily during the summer蕀onths from 10.30am until dusk. There is a refreshment room that is open to the general public that serves a selection of hot and cold drinks and snacks, all at very reasonable prices. Senior Citizens and Students �00; Family £9.00; Groups/Parties are welcome.